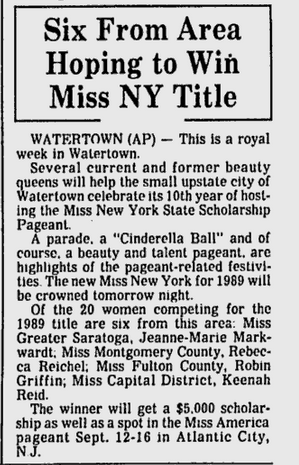 The Miss Capital Region Scholarship Organization ran between 1992 and 1999, adding the Miss Northeastern NY title in 1994. Contestants were eligible if they lived in Albany, Schenectady, Rensselaer, Saratoga, Warren, Washington, Columbia, Greene, Fulton, Montgomery, Hamilton, Dutchess, and Ulster. For more information about Miss Capital Region and Miss Northeastern New York, please click here.